When I was 18 me and my friend decided we wanted to get a tattoo. We had just finished out A- level’s and were a week from our first girls holiday. The tattoo idea was mentioned a week before we went to get it. 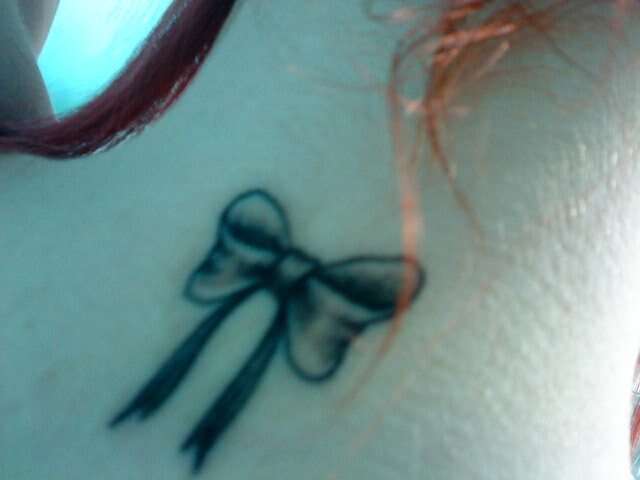 She got a star (original :P) on her hip and I got a bow on the back of my neck. Yes, it killed, and yes, i nearly fainted. When asked why I got a bow, my response? It reminds me of my girly side. When i was growing up I was the ultimate tomboy. Playing with all the boys in my street, climbing trees etc and even though my friends tel me i am definitely a girly girl now, it still symbolizes the girl inside me. Sounds stupid i know, but that’s my response. People always say that you get the itch to get more once you have one, and the is definitely true. I have many thoughts about my next tattoo. I want ‘LIFE’ tattooed on my wrist because that is what ‘Zoe’ means. But now I want something to do with books as well. I’ve thought whether I’d have a quote tattooed one me…but which one? Or something symbolic from that book? My love of books will never dwindle. Whomever i end up with will have to deal with my kindle being my baby. Me being an emotional wreck when reading and my love of book boyfriends. But i ask you this, do any of you have a book tattoo? Or would you consider getting a book tattoo? I don’t have any tattoos but I have been wanting one for years (the only thing stopping me is tattoo regret). The tattoo I want is “Je m’ouvrais pour la première fois à la tendre indifférence du monde” on my underboob/rib area. It is a Camus quote from L’etranger. That is both bookish and meaningful to me personally. After reading The Fault in Our Stars I wanted “okay” somewhere. After reading True I wanted “true” though that wouldn’t really make sense because it is initials in the book and not my initials : ) Maybe it is a good reason I haven’t made the tattoo plunge otherwise I would be covered in random things from all the books I love – could get very dangerous! I am having one ( my first) in sept when my book comes out. It is a personal phrase that means a lot to me and I have used in the closing stages of my novel, Foi Vainquera – faith conquers. I am rather scared and you will probably be able to hear my screaming all the way in Wales! Oh that quote is so nice ❤ Where are you wanting it? My sister had you’ll never walk alone across both feet in Arabic (bet you can’t guess what football team she supports) then drank three pints of cider and threw up everywhere! Probably on my wrist in script! Just realised I gave away a teeny plot spoiler there! Erase it from your memory or act surprised when you read it! Hahah i definitely know the football team 😛 Ohh crap, no way?! What do you mean what am i on about, I did not say anything!! Lol! I love tattoos… But I don’t think I would ever get a book tattoo. I have books that I love – but what’s not to say that I won’t love the next book I read? Or the one after that? And will I regret not picking THAT book for my tattoo? Decisions decisions! Definitely a lot of decisions! I totally wouldn’t take it lightly. My fav book is The Edge of Never – but mainly because i relate to Camryn (Have you read it?) and her need to just pack a bag and travel, find herself lol. Ah yes, the post A-Level tattoo, been there done that. £60 later, it hurt a lot. I’d quite like another one but can’t figure out what I’d have. After reading Philip Pullman’s Northern Lights, I thought maybe I’d get a tattoo of whatever my daemon is… But still can’t decide on that either! Ahh what did you get? I thought I was so cool getting a tattoo at that age lmao.